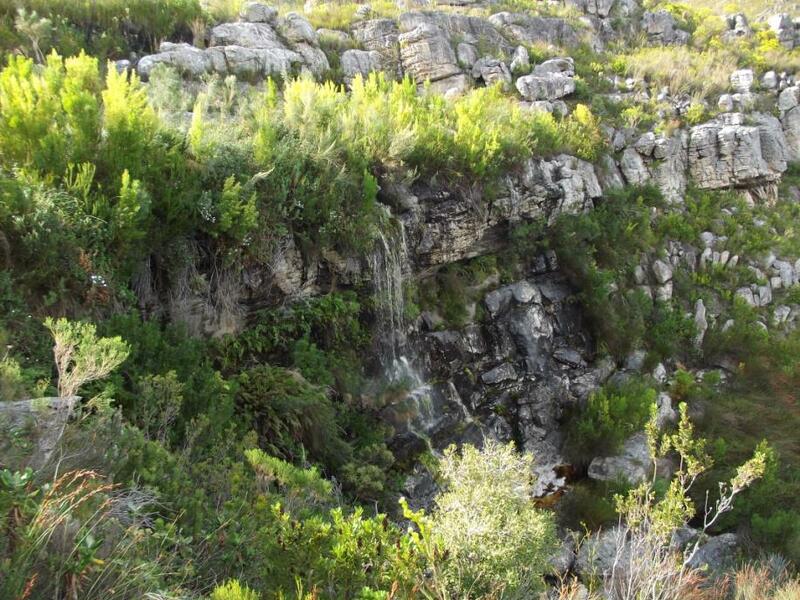 The objective was to scout the Plateau Path above Fairy Glen in the Kleinmond Mountain Nature Reserve. The fire of early 2017 and the rains of two winters since then must surely have yielded some profit. Principle quarry included seedlings of Protea mundii and re-growth of Pillansia templemanii, both of which had been burnt to a cinder fifteen months ago. Were they recovering? So it was that a doughty group of nine members and guests set off from the Fairy Glen picnic site in crisply cold, sunny weather, trying to avoid looking up lest we be disheartened by the prospect of the slog up the path past Kasteelkop to the plateau above. We needn’t have worried. The path ascends by relatively easy stages and before we knew it, we were having a tea break at the top of the trail. July is the time when cone bushes (Leucadendron sp.) make up for the weak winter sunlight with their golden yellow new growth. What are those swathes of bright sunshine yellow cone bushes lining the streamsides? Most likely Leucadendron salicifolium, aka Common Stream Conebushes. 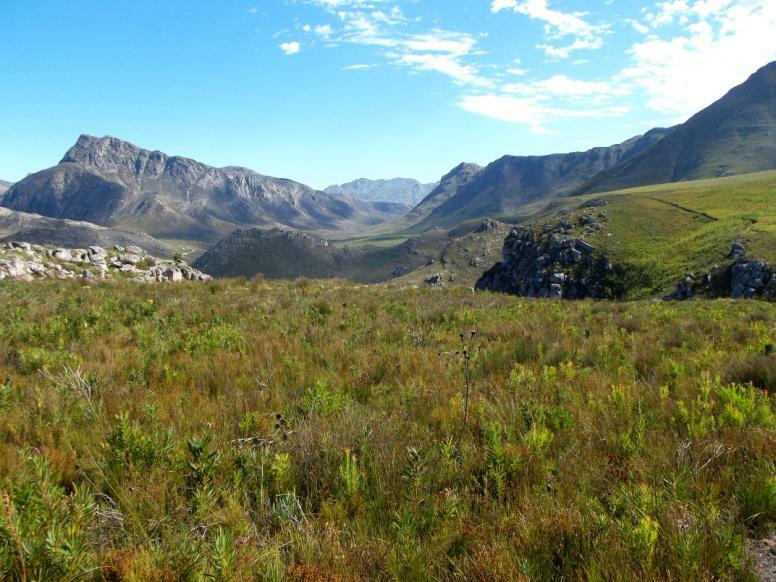 Once on the Plateau Path the going is easy, with splendid views into the Kogelberg’s Palmiet River Valley. The soil underfoot changes from sand to clay and you know you are on the shale band. Low growing Protea cordata, with its heart shaped leaves, red stems and brown, papery flowers at ground level, flourishes in the clay soil. Despite a woody rootstock, the little P. cordata is destroyed by fire and recovers from seed – which they are doing abundantly. One-year-old fynbos gives little plants their opportunity to shine, tiny Disperis capensis among them, also known as ‘moederkappies’ or ‘granny’s bonnet’. Like so many orchids, D. capensis doesn’t pay its bills, providing pollinators with no nectar for their services. It relies, instead, on mimicry, in this case, it is said, mimicking Polygala species to attract the attention of carpenter bees. No matter, D. capensis is an exquisite little orchid. Once you see one on the trail, others become easier to spot. What about our principle quarry? Burnt skeletons of once densely packed Protea mundii alongside the streams, surrounded by seedlings of all kinds as thick as hair on a dog’s back, told us where the new generation will emerge. Although it’s a fast grower, we’ll have to wait another two years or so before the first flowers of the new generation appear. For now it’s difficult to tell how abundant P. mundii will be. We do know this is a western outlier population of P. mundii occurring at altitudes from 200 m between the Kogelberg and Hermanus. The greater concentration of them is in the Outeniqua and Kouga mountains of the Eastern Cape. 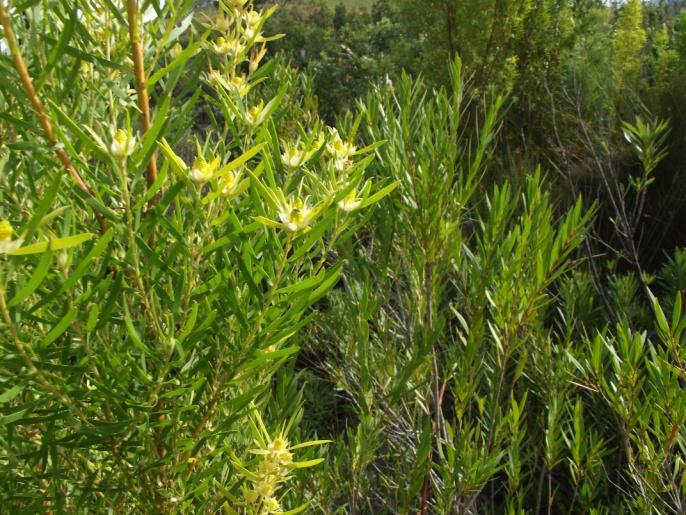 The destruction by fire of the dense canopy of mature Protea species has provided an opportunity for immense stands of monocotyledonous geophytes to emerge. And there among them are masses of the distinctive gently spiralled leaves of Pillansia templemanii, not in flower yet. October and November will be a good time to pay them a visit. No promises, but the display of these rich orange flowers could be astonishing, along with the purple, red and blue of the genera Watsonia and Aristea. Another tea break at the top of the Klipspringer Path fortified us for the steep and rocky descent past the waterfall and stands of Podalyria calyptrata coming into flower as we plunged into the shade of the little patch of Afrotemperate forest charmingly named ‘Feetjiesbos’. Three hours well spent.